The problem with liars is that they must continue to lie in attempt to mask their previous lies. 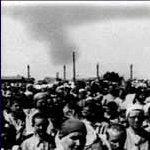 Nothing better exemplifies that fact than the 'holocaust' storyline, a seemingly endless string of lies. Here we have the fraudulent Anne Frank "diary" being marketed for profit and propaganda purposes. As usual we must ask 'who benefits? Who profits? It's clear to anyone who applies rational thought and scientific analysis to the Anne Frank "diaries" that it's the work of a forger, or forgers. Also, a very inconvenient fact, Anne Frank was not murdered. Hmm, shouldn't she have been? ... if the 'holocaust' storyline was true, that is. Anne Frank's Diary. Providential proofs of authenticity. Read below of the continuing exploitation of this fraud while at the same time there is an attempt to make it appear as if there are those who are uncomfortable with the profiteering. Which is laughable considering that the entire 'holocaust' scam is all about exploitation, profit, power and gain. And as usual with these folks, gratuitous sexual issues have been added to this theatrical production. Rather, familiar eh? I can't wait for these shysters to put together a theatrical production which explains how Jews were supposedly 'gassed', which is utterly impossible as alleged. As a result of Revisionist progress I suspect we'll be seeing more of this theatrical, staged form of lying which is solely reliant upon conditioned masses. Hollywood knows all about it. There's no business like $hoah business. “We think it is important that a place exists where the life and work of Anne Frank are presented in an authentic and historically reliable way,” said museum spokesperson Annemarie Bekker in a Times of Israel interview. “Adaptations such as theater plays, films and musicals almost always contain fictional elements that can seem factual, and this can occasionally be problematic,” said Bekker. Up to 1,100 spectators are treated to 180-degree action that includes massive projections of the Nazis marching into Dam Square and — later in the play — Frank’s original handwriting. In feud with Amsterdam museum, copyright holders are using final year before diaries enter the public domain to push a play, a TV docudrama, films, apps and an archive. 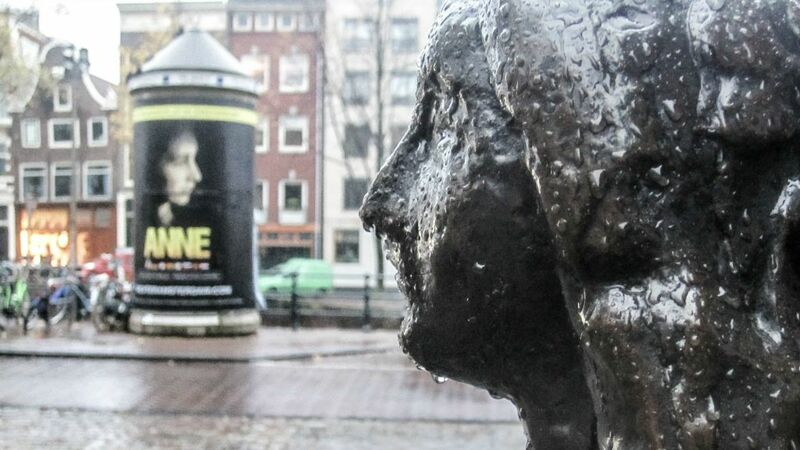 AMSTERDAM – When it comes to telling Anne Frank’s story, the timeless adage, “the more the merrier,” is way off the mark. In the city where Frank spent most of her short life and hid from the Nazis, a legacy feud is simmering between the owners of Frank’s writings — the Switzerland-based Anne Frank Fonds — and stewards of the “Secret Annex” museum visited by more than one-million people each year, the Anne Frank House. The spat has intensified in recent months, following the May premiere and early commercial success of “Anne,” a new play created at the Fonds’ behest. The high-tech production is the first since 1955’s “The Diary of Anne Frank” on Broadway to be based on Frank’s original writings, and it’s housed in a custom-built theater on Amsterdam’s west port. For several years, the Fonds has waged a legal and media battle against the Anne Frank House, revolving around the Fonds’ demand that 25,000 original family documents and photos be returned to it by the museum. Related to these tensions, “Anne” is one of several new projects the Fonds hopes will counter the museum’s supremacy in attracting a Frank-adoring public, not to mention maximize the final months before the diarist’s writings enter the public domain. According to Fonds board member Yves Kugelmann, a journalist based in Basel, the task of maintaining Frank’s legacy was entrusted solely to the Swiss foundation on whose board he sits, set up by Otto Frank in 1963. 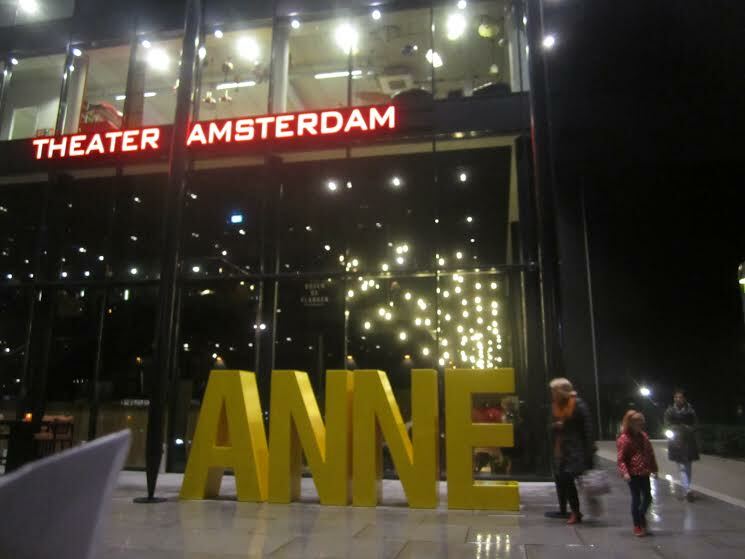 The Theater Amsterdam, built in 2013 to house the production 'Anne,' based on the writings of Anne Frank. “There is but one unique Anne Frank organization that was initiated and founded by Otto Frank and assigned by him to safeguard the family’s legacy, to spread the diary, and to guarantee the educative work,” Kugelmann told the Times of Israel in an interview. Anne Frank, age twelve, at her school desk in Amsterdam, 1941. 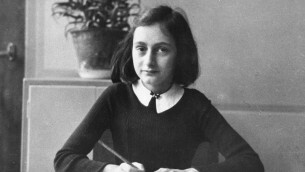 “The Anne Frank Fonds inherited all copyrights of Anne and Otto Frank,” Kugelmann pointed out. “Its aim is to represent the legacy and the family, and to make the diaries and works by Anne Frank accessible to the general public. All income from the copyrights of the diaries is used for educational or charitable projects,” he added. Kugelmann said he is pleased more than 120,000 people have seen “Anne” to date, and he hopes other new Fonds projects will capture the public’s imagination. 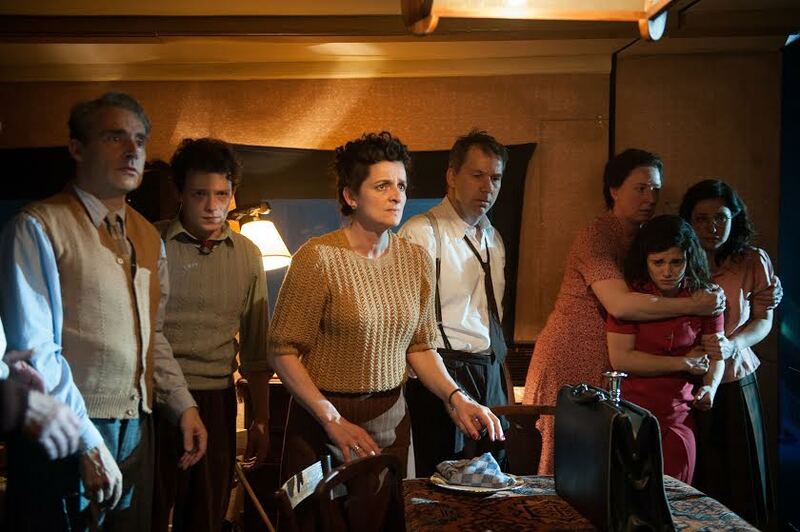 In February, several countries will air a new Anne Frank television docudrama produced in Germany by the Fonds. A feature film, an animated film, and new apps are in the works, but most promising is the creation of the Frank Family Centre, an ambitious archive to be housed in Frankfurt’s Jewish Museum. Opening in two years, the archive could eventually rival the Anne Frank House on the tourist track, if the Fonds has its way. Kugelmann and the Fonds have long bemoaned the “shrine-like” atmosphere of the Amsterdam museum, something Otto Frank himself requested be minimized. For its part, the Anne Frank House points to Frank’s role in setting up the museum, as well as the institution’s commitment to sharing Frank’s legacy around the world. With admissions revenue and donations, the museum hosts hundreds of educational programs on-site each year, and 5,000 “Anne Frank Ambassadors” organize projects in three dozen countries, added Bekker. To the Fonds’ chagrin, Frank’s writings are set to enter the public domain in January 2016. The foundation’s legal actions have failed to alter this eventuality, so we can anticipate a new, unregulated afterlife for the diary. Very soon, the question of who is allowed to use the most famous Holocaust victim’s words — and to what end — will be a moot point. Clocking in at over three hours, “Anne” boasts a fully revolving, three-story Secret Annex set, and a good deal of slapstick to balance what production notes refer to as “universal values” to be drawn from Frank’s story. When we first meet the coquettish teen, she’s sitting in a gorgeous Paris café after the war. In walks a dandy publisher who is actually Frank’s pre-hiding crush, Peter Schiff. Having been “inseparable” with Frank during the summer of 1940, the revived Schiff — also a Holocaust victim — becomes her guide through traumatic flashbacks. Other writers have given Frank a post-death life — Auslander, Ozick and Roth come to mind — but none of them had unlimited access to a trove of unpublished materials. “Anne” barely makes use of new research, and the touted inclusion of Frank’s post-hiding experience in Nazi camps amounts to one quick, opening voice-over, plus a hokey final scene where Frank literally hops down the train tracks at Bergen-Belsen. As usual, Frank is played by an actress pushing 30, even though the play opens with her thirteenth birthday. To her credit, Rosa da Silva’s portrayal is moodier and less saccharine than most Frank depictions, and da Silva maintains presence even during cheesy afterlife scenes between Secret Annex fiascos. The cast of 20 actors has its thunder stolen with what seems to be an incessant revolving of the Secret Annex set, always accompanied by creepy music to build tension. Emotional outbursts are over the top, such as when gusty Mrs. van Pels bangs wildly on an uncovered window while screaming at the top of her lungs — unlikely behavior for a Jew in hiding. Though audiences may hunger to feel more of Frank’s “inner turmoil,” the production is not shy about depicting the teen’s burgeoning sexuality. The flirtation between Frank and Peter van Pels climaxes one evening in Act II, as van Pels bounces Frank up and down on a bed with his hand. In walks Otto Frank, who promptly breaks up the love-nest. No such incident appears in Frank’s diary, but — in the spirit of other Anne Frank afterlife frame stories — doesn’t it just add to the drama?